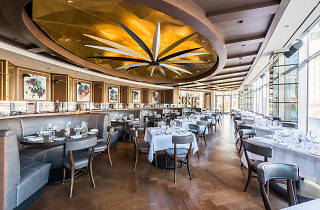 Enjoy your steakhouse favorites with some Italian flare in a contemporary space designed with mid-century Milan in mind. Gibson’s Italia is a swanky, tri-level Italian restaurant and steakhouse in West Loop. This lavish venue has a first floor lounge, second floor dining room, and third floor retractable rooftop. 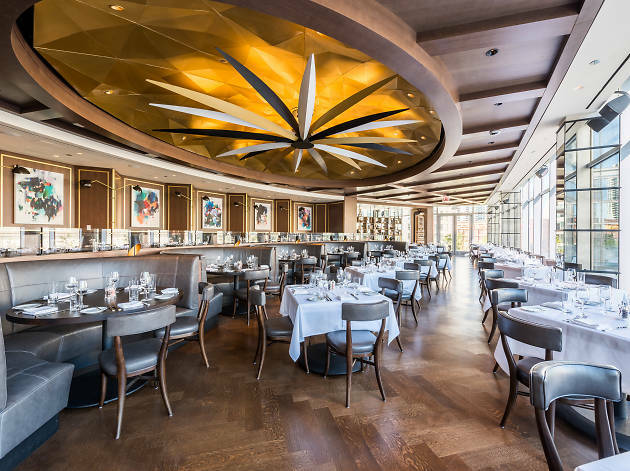 The dining room patio and rooftop have breathtaking views of the Chicago River and skyline. The menu is full of intricate dishes inspired by European influences, and everything I tasted was amazing. Pictured here are some of the dishes I tried including 1) Banana Gelato with Oreo crust, salted caramel, bruleed bananas, and whipped chantilly 2) vegetarian caserecce with asparagus, parmiagiano reggiano, and corso risotto 3) Acquarello Aranchi with shaved Umbrian truffles with 1 year aged risotto in tomato suga.